Have you ever pulled a box of Hamburger Helper, or something similar, out of the pantry for a quick and easy meal for your family on a rushed evening? I, myself, am guilty of having done this at least a few times. Even when I’ve bought these ‘box’ meals on sale or with coupons it’s still not particularly ‘cheap’ considering I always have to add more pasta, spices, and other ingredients to spruce it up. It doesn’t even taste that good to my husband or I, although I am sure my kids would eat it any day with no complaints. I know in the past I’ve sacrificed our personal preferences, quite a few times, for efficiency, using a ‘box’ meal to get dinner served to my kids on time, but NO MORE! 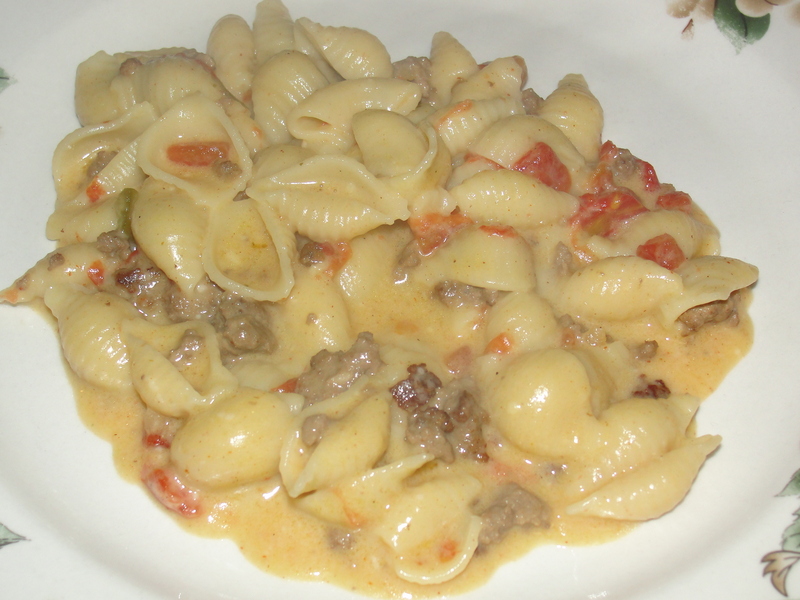 Homemade Cheeseburger Macaroni is creamy, cheesy, and easy. Both the kids and the adults will love it. It even takes about the same amount of time to make as it’s pre-packaged competition. Ditch the ‘helping hand’ and make your own batch from scratch. My recipe feeds my family of six, with enough leftovers for my husband’s lunch the next day. The recipe can easily be cut in half to accommodate a smaller family. In a dutch oven brown hamburger meat until cooked through and then drain and return meat to the pot. Stir in taco seasoning, tomatoes, beef broth, and macaroni. Heat to boiling, now reduce heat and cover. Simmer 12-14 minutes, stirring occasionally. While the beef and noodle mixture cook, melt butter in a saucepan. Whisk in the flour and cook over medium heat, constantly whisking for 2-3 minutes. Slowly add in the milk, whisking constantly, and bring to a boil. When your sauce base is smooth and thickened remove from heat and stir in the cheese until melted. Add the salt and pepper to the cheese sauce. Pour the cheese sauce over the hamburger mixture. Stir gently until evenly combined. Remove pot from heat and let sit about 5 minutes for the sauce to thicken up and serve.